Does anyone else have a special bond with their purse, or is it just me? Call them a purse, pocketbook or a portmanteau, we women love them. Seriously, isn’t it gorgeous? It holds an amazing amount of things, it has pockets everywhere, plus a key clasp which I love—no more rooting around for my keys. 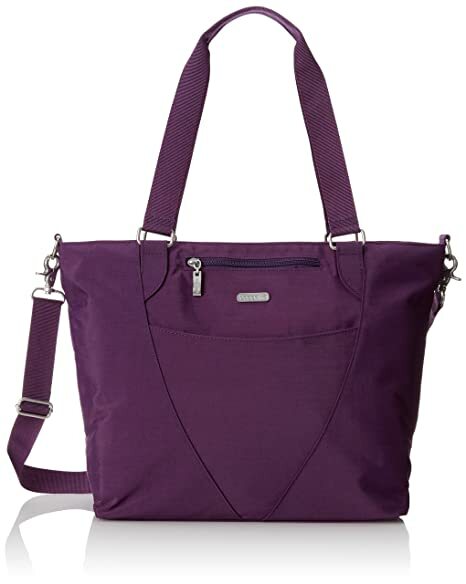 It has a shoulder strap as well as regular short ones, and the color works with nearly everything I own. As I usually dress in black, purple, turquoise, red, lime, cobalt or orchid anyway, the purple purse works. Now, that said, I find myself clutching it to me like a life-line. The last time that the Crankee Yankee and I went to see a movie, I kept my purse on my lap the whole time. Since this particular movie had been out for a while, the audience consisted of we two plus two other couples, so I could have just put the bag on the seat next to me. But it seems I formed a special purse-bond with this amazing bag. Obviously when out in public I don’t want my purse far from me in case of purse-snatching, but in the movies no one was anywhere near us. Purse paranoia, I guess. When we are driving somewhere, I could certainly put the bag in the back seat, but no—I like to have it in my lap. So there I sit, with it squatting on my lap like a big purple pussycat. Is it me, or does anyone else feel the need to carry all this stuff around like a “*bug-out” bag? *Per Wikipedia, “The term “bug-out bag” is related to, and possibly derived from, the “bail-out bag” emergency kit many military aviators carry. In the United States, the term refers to the Korean War practice of the U.S. Army designating alternative defensive positions, in the event that the units had to displace. They were directed to “bug out” when being overrun was imminent. The concept passed into wide usage among other military and law enforcement personnel, though the “bail-out bag” is as likely to include emergency gear for going into an emergency situation as for escaping an emergency. This entry was posted in Things we love.